Supporters and opponents of CMP's proposed transmission line gather ahead of a hearing on the issue. Central Maine Power Company and Hydro-Quebec are offering a benefit package worth hundreds of millions of dollars to try to win support of their controversial plan to build a transmission line through western Maine forests. CMP wants to upgrade existing transmission lines and build new line through 50 miles of Maine's western forests to bring electricity from Hydro-Quebec's dam systems to customers in Massachusetts. The $1 billion project has drawn fire from local citizen groups and many - but not all - environmental groups. It's won support from some industrial electricity users, unions, construction companies and the state Chamber of Commerce. Now CMP and Hydro-Quebec are trying to win over more. The companies floated the new offer Tuesday to a group of 30 parties to a permit case before the state Public Utilities Commission. Confidential documents from that meeting were shared with Maine Public Radio and other media outlets. $190 million to reduce rates for Maine residents over 40 years - with $50 million of that set aside for low income consumers. $200 million to improve transmission interconnections, which CMP says will help renewable energy projects in Maine find "headroom" on the grid. The proposal includes a variety of perks aimed at environmental advocates. 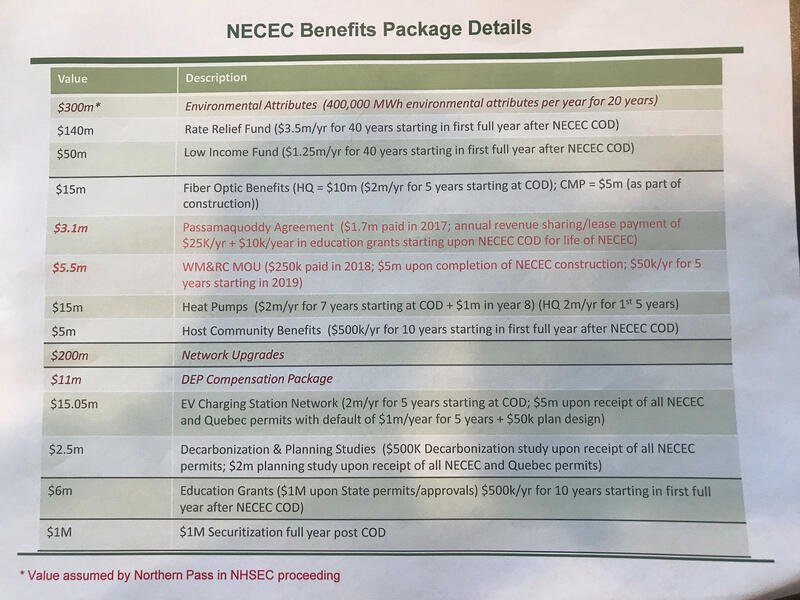 Those include $15 million to subsidize residential heat pump purchases and $15 million for an electric vehicle charging station network, plus consumer rebates for electric vehicle purchases. Another $2.5 million would fund planning studies on "decarbonization," meaning reducing carbon-dioxide emissions from Maine. One Maine-based regional environmental group, the Acadia Center, now says it can support the project's permit application to the Utilities Commission. Deborah Donovan, a policy analyst at the center, would not talk about the proposal's details. But broadly speaking, she says, “we do advocate for rapid decarbonization using tools like electrifying the transportation and building heating sector. So to the extent that there's provisions in the settlement that would move those along, that would be consistent with our priorities for Maine, in terms of improving the electric system." Donovan adds that Acadia still has not decided whether to support the project in related permit proceedings in Maine and Massachusetts that focus more closely on environmental questions. 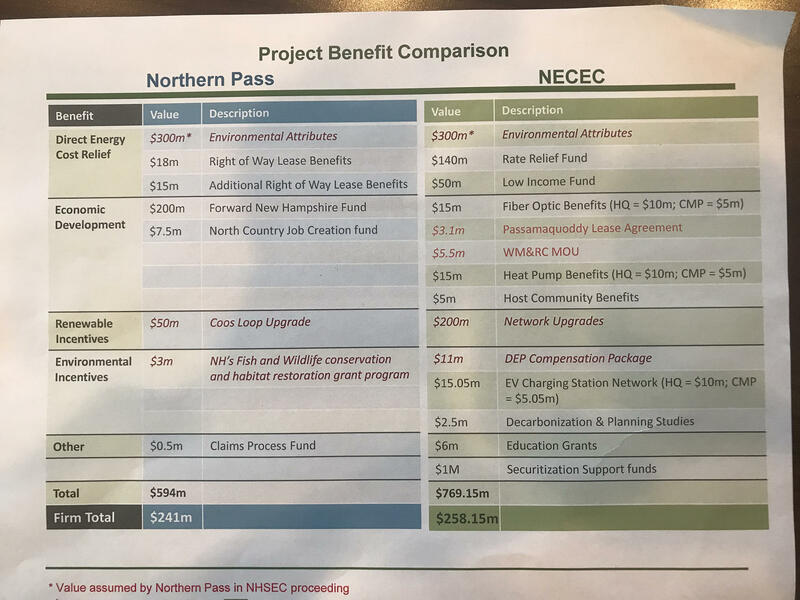 The documents show that CMP is also proposing to spend $200 million to upgrade transmission interconnections to improve access to the grid by renewable energy generators in Maine. Maine-based electricity generators have opposed the project, saying the big slug of Canadian electricity coming through — enough to power 1 million Massachusetts homes — would inhibit Maine-based wind, biomass or solar power's access to the grid. And Jeremy Payne, the executive director of the Maine Renewable Energy Association, says that he is wary of CMP's new proposal. He also declined to speak to details, saying many of them are still not fleshed out. "It's a little difficult to assess whether they are bringing this forward because they understand how vulnerable because they are at a tipping point, if this is because of the change in administration, or change in the general attitudes of the general public, or the host communities. It's a little difficult to figure out, but clearly they have seen some signal that has caused them to panic." A CMP spokesperson says the company would not comment, citing confidentiality requirements for the negotiations. And the Conservation Law Foundation, which is cited in the documents as the potential co-manager of the $15 million electric vehicle fund, also declined comment. One environmental group, though, is showing no signs of throwing support to the project. Dylan Voorhees, the clean energy director for the Natural Resources Council of Maine, says while it's too early to weigh in definitively, “I would say that there are an awful lot of issues that are unresolved that are important for this project for our members, and don't address the fundamental concern that we have with this project, which is it doesn't have a climate benefit because it's not actually new generation of renewable energy, and it has enormous impacts to the landscape across Somerset and Franklin County from wildlife to recreation." Barry Hobbins, the state public advocate, declined comment, but last year demanded that CMP provide at least $50 million in rate assistance for low-income customer — money CMP has now put on the table. And the documents show that CMP's new offer would add another $140 million to that to reduce rates for all Maine customers. One intervenor estimates that would reduce rates by about three-tenths of a cent per kilowatt hour. That would save the average electricity consumer in Maine about a $1.50 per month. Originally published 4:32 p.m. Feb. 6, 2019. Stakeholders in Central Maine Power's proposal to build a new high-voltage transmission line through western Maine begin formal negotiations Tuesday on a deal that could help the utility win approvals from state regulators. And CMP is getting ready to put a lot more money and other benefits on the table. The House chairman of the Legislature’s Energy Committee put a bold proposal on the table on Monday: create a new authority to buy out electricity system poles and wires owned by Central Maine Power and Emera Maine.